Can I Give My Ferret Cat Food? | Can i Give My Ferret? Can I Give My Ferret Cat Food? Ferrets and cats are both carnivores. Both need a specific set of nutritional requirements to keep them healthy. They both don’t have the ability to fully digest the nutrients in plant materials. 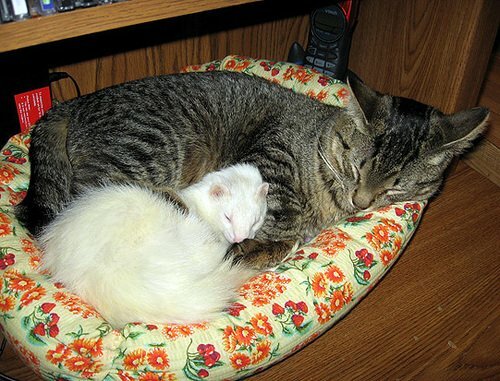 Cats and ferrets require diets that are high in animal protein, and low carbohydrates and fiber. That’s why many consider cat food as the best alternative to ferret food. Although cat food comes closest in meeting those special dietary requirements for ferrets, not all cat or kitten foods have the same contents. Feeding your ferret some cat food is not strictly prohibited. However, you must be very picky and avoid giving your pet just any kind of cat. Relying solely on cat food may lead to improper nutrition that could lead to serious illness and cause death. Can I give my Ferret Kitten Food? Kitten food has been considered the best alternative to traditional ferret foods. If you find it hard to locate a shop with available ferret products, then kitten food can be a good choice. Just be very cautious and always check the label. It is also important to note that crunchy cat food is way better than the soft kind. Canned cat foods are not recommended to feed your ferret for a couple of reasons. First, it is very hard to achieve an adequately high caloric density that can meet your pet’s need when using canned foods. Second, it is quite difficult to keep moist products fresh. Canned cat foods are also not crunchy enough and would do no help in removing plaques in your ferret’s teeth. Many ferret owners are also choosing cat foods because they are cheaper. And like other dry and crunchy pet food, cat food can be stored for longer periods of time. When buying cat or kitten food for your ferret, make sure that the label suggests that it contains high quality and easily digestible animal protein. It should contain more than 33 percent of proteins. It is also not recommended to buy something that uses plant based protein as ferrets can’t simply digest this kind of matter. Ferret diet must likewise be high in fat content and low in carbohydrates. It should have 15 percent of fats at the minimum. Its fibers component should also be less than three percent. So read the label very carefully before buying. You must see to it that the ferret foods you choose have the right components all the time. These days, more and more pet stores are offering ferret foods. Buy your ferret food from a trusted supplier or from a pet store with well-informed staff. Like any other pet food, not all ferret foods are created equal. Some may contain large amount fillers, which are unnecessary. You can also mix some raw or cooked meats to your ferret’s diet. Instead of relying solely on cat food, it is recommended to add quality meat to your pet’s nourishment. Giving him some calcium and taurine supplements can also help improve his health. However, it is suggested not to feed your pet with frozen meat. Ferrets generally hate this kind of food, besides it contains lesser nutrients. In case you decided to change the brand of ferret food you give your pet, ensure not to change it completely. Any drastic change to your pet’s diet is not recommended. Suddenly changing your ferret’s current diet may cause your pet to react badly. He may be surprised and most probably would not accept this abrupt change in his regular meal. The best thing to do is to mix a small amount of the new brand with his current food. Then you can gradually increase the amount of the new brand. You should do this until you totally replace the old food with the new preferred ferret food. As the metabolism of ferrets is quite high, you must provide enough nourishment to ensure proper digestion. It is recommended to feed your pet every three to four hours with the right kinds of foods. Treats and snacks are fine as long as they are not too sugary. Treats should also be given in small servings so as not to affect his meal schedule. Remember that what you give your pet will greatly affect his wellbeing. It is your responsibility to know what’s best for him. There is definitely nothing wrong with improvising or using alternative diet options. Just ensure your ferret still meets his daily nutritional requirements.